Irony is a literary technique in which what is written or stated is different from or the opposite of what is expected. There are several types of irony. For example, verbal irony is when a person says the opposite of what they mean, often to sarcastic effect, such as when a customer says "Good job," to a waiter who has dropped his tray. As you'll see in the examples below, situational irony also requires one's expectations to be thwarted, but in this case, it occurs when an expected outcome does not happen, or its opposite happens instead. Situational irony is also sometimes called an irony of events. The outcome can be tragic or humorous, but it is always unexpected. A fire station burns down. This is unexpected because one would assume the fire chief would keep his own building safe. A marriage counselor files for divorce. This is ironic because the expectation is that a professional who coaches couples through rough patches would herself have a strong marriage. The police station gets robbed. Again, the expectation is that professional crime fighters would be able to help themselves; in this case, by securing their own station. A post on Facebook complaining how useless Facebook is. This is ironic because one would expect someone who dislikes Facebook to stay away from it instead of using it to make their point. A traffic cop gets his license suspended because of unpaid parking tickets. Because the traffic cop is usually the one issuing tickets, most people would assume he always followed the rules. A pilot has a fear of heights. This situation is ironic because airplane pilots spend most of their time at work high in the air. A member of PETA wears leather shoes. Because PETA members work to protect animal rights, one would assume they would avoid products made from animal skins. The teacher fails the test. Teachers are usually the ones giving tests rather than taking them, so most people assume they would be expert at passing tests. A man who needs medical assistance is run over by the ambulance. In this case, the man got the exact opposite of what he needed from the medical help on the scene. An anti-technology group sets up a website to recruit new club members. People who dislike technology aren't likely to be looking for clubs on the internet, so using technology to recruit is unexpected. Two people want a divorce, but during the proceedings they discover they still love each other and get back together. This is the opposite outcome of what happens in a typical divorce, which makes the situation ironic. A child runs away from someone throwing a water balloon at him and falls into the pool. This is ironic because the child ends up wetter than he would have been, thwarting his expectations of what would happen when he ran away from the water balloon. A cobbler is a professional shoemaker, so the expectation is that her own children would have many shoes, not zero. The President is wounded when a bullet ricochets off his bulletproof car and into his arm. This outcome was definitely not what the Secret Service had in mind when they ordered a secure vehicle. A man leaps out of the road to avoid being hit by a car, only to have a tree branch fall on his head. This is not the outcome the man expected because he thought he would escape being hurt. A group of fans enters a stadium excited to see a football game, only to discover that the sign meant soccer rather than American football. Expectations can also be unmet due to simple misunderstandings. A Wall Street investor makes fun of others who are afraid of a risky stock pick but later loses all his money. The investor's expectations were not borne out in his stock performance, but there's an increased sense of irony because he was so confident. A mother complains about her lazy children, not realizing they have been secretly making her a birthday present. In this situation, the mother's ideas about her children are thwarted in an unexpected surprise. A man works hard for many years to save for retirement; on his last day of work he is given a lottery ticket worth millions. The unexpected riches are ironic because the man lived a frugal life assuming he would have to work hard to earn enough to retire. A husband realizes it's his wife's birthday and rushes to make dinner reservations, only to find that she has forgotten what day it is and stayed at work late. The husband expected to treat his wife, by the plans end up ruined anyway. It's only the reason why that's unexpected. - "O my love, my wife! Death, that hath sucked the honey of thy breath, Hath had no power yet upon thy beauty." 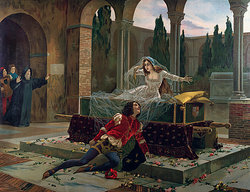 Romeo finds Juliet drugged and assumes she is dead. He kills himself but then she awakens, sees that he is dead and kills herself. This is ironic because both lovers killed themselves over a mistaken assumption, leading to a tragic outcome instead of the happy ending the lovers expected. - In this book, the firemen set books on fire rather than put out fires. The book has been on the top 100 list of banned books in America, which is ironic because the novel is about the dangers of book burning and censorship in society. - In this story, the wife cuts her long hair and sells it to have the money to buy her husband a pocket watch chain. He sells his watch to buy her a hair accessory, leaving both with a useless gift, which was not what they expected for their efforts. - Cronus believed a prophecy that he would be overthrown by his children so he devoured any children Rhea, his wife, had. However, she tricked him with Zeus, giving Cronus a stone wrapped in swaddling clothes instead of the baby. Zeus later rescued his siblings and they overthrew their father, which was unexpected for Cronus, who thought he had outsmarted his fate. - Oedipus was abandoned by his parents due to a prophecy that foresaw him killing his father and marrying his mother. He returned to his ancestral home as an adult and fulfilled the prophecy without realizing it until it was too late. - Tartuffe cons his benefactor to get title to Orgon's house. He goes to the house with a policeman to finalize the eviction order but is instead arrested for being a crook. - "Water, water, every where, Nor any drop to drink." Though seawater is all around, the mariner is dying of thirst because it is salty and cannot be drunk. - "Whosever room this is should be ashamed! Donald or Robert or Willie or-Huh? You say it's mine? Oh, dear, I knew it looked familiar!" In this poem, the narrator's room is so messy he can't even recognize it. The unexpected twist at the end is that he realizes he's been complaining about his own mess. - When a wife hears of her husband's death she begins to imagine a life of freedom without him, but he suddenly returns home alive and well. This is so unexpected that she drops dead of shock in a twist that surprises both the characters and the reader. - Throughout the books, Harry Potter is expected to kill Voldemort, but he eventually realizes he must allow Voldemort to kill him instead. This is a major reversal in what was expected throughout the books. Looking for more examples of irony in life or in literature? Check out the YourDictionary articles providing further examples of Dramatic Irony and Irony in History. "Examples of Situational Irony." YourDictionary, n.d. Web. 18 April 2019. <https://examples.yourdictionary.com/examples-of-situational-irony.html>.